Pimp my Hi-Roof Black Trooper project ( part 2 ) – "da Trooper Bali"
From Bali Island with Love, Freedom and Respect……! The five weeks Saturday noon. As usual, upon home from the work office, I drive my Red Mitsubishi diesel to the work shop to have a look and monitoring the progress of the project. This day I found that the mechanic still work with the small part of the rusted flat part on the back of the body exactly in the bottom of the side of the floor deck, near the hose of the fuel tank which is very difficult to remake. 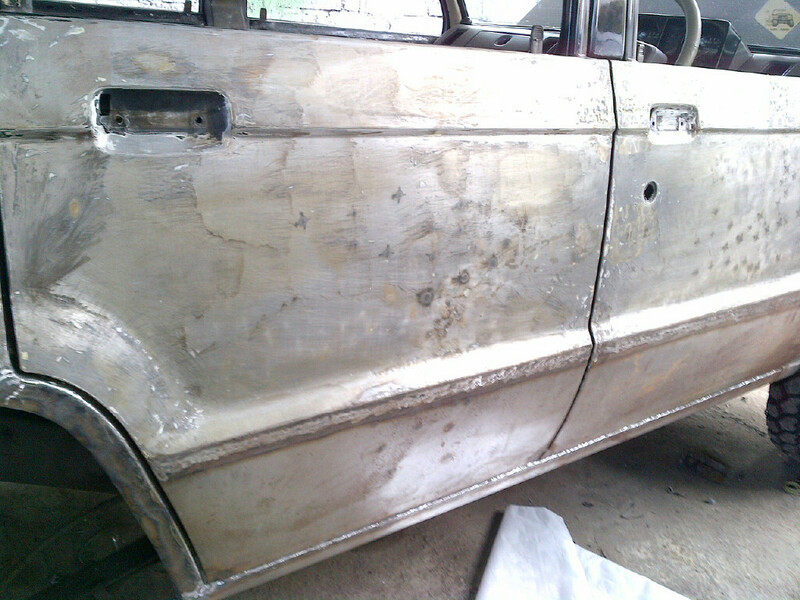 The right body from the doors, front vender and the side floor are finish remake, and he continue to remake the rear doors, the small unique door and the main door, where most of the bottom doors are porous by rust and make a hold around. The door are now release from its position and laying down on the used tire to check the panel, the paint are removed till the surface of the metal appear, by this time we can assigned the area which was porous by the rust. The mechanic measure the size of the door panel and decided to cut down by 12 centimeters from the bottom to waive the porous part. 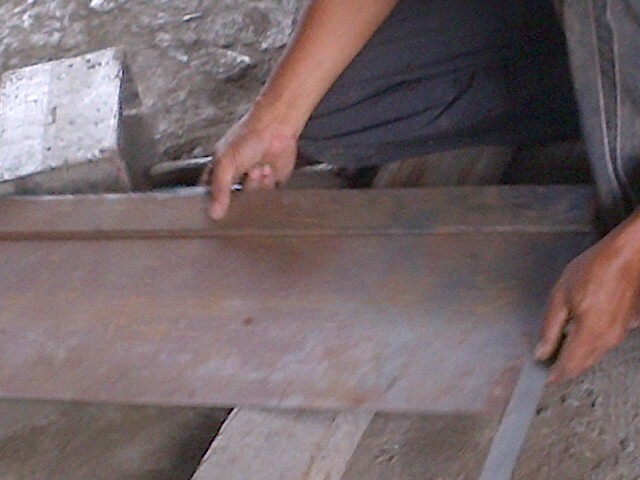 Then measuring the metal plat to remake the door. The new flat metal is now cut and remake the body line as detail as the origin and paint the inner surface with anti rust paint. 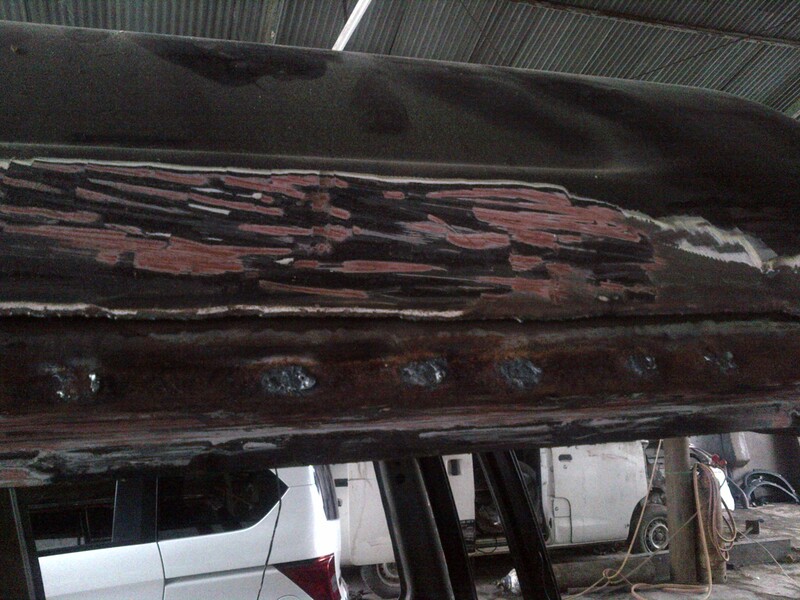 After the paint dry, the panel then welded on the original door frame to remake. And the main rear door finish in one day. Quiet fast compare to the small part of side floor. And continue with the small unique door, with also porous by the rust at the bottom of it. He start to work to measure the size of the panel, cut the flat metal, paint with the anti rust paint and welding it on the frame of the door. The unique small door do in the same way and take another one day to remake it. After this door finish, the are fit and placed on it place after fitting and fit. All the doors are now finish changed the metal and remake and now all of the surface of the doors are brushed by sandpaper till it’s clean. After deep clean then cover by primer foxy paint to avoid from the oxidant of rust. The water line are serious porous by the rust til the inner frame of the roof. After all the doors are finish, now start to work with the water line in the roof, where it seem there is a porous rusted on the line. I believe that it is all the line must be cut down as I can see there is some porous spot a long the line. So the mechanic now remove the paint along the water line to inspect how many deep the porous is. He cut by the welding fire the water line and remove the old outside metal so we can see that the frame of the roof is also porous by the rust and must also cut to replace the metal. Seem this part also quiet difficult to do since it’s position in a difficult place. I believe it will take quiet long time to do so. But Mr. Demung the mechanic can do it so patience and very detail. He measuring the part by part and make the patronage from the thick carton paper and fitting the patronage on it position precisely, and afterward he make the real part by metal flat and make it the position and the lay out precisely as the originally. It take about 4 days to do the roof inner frame to make it precisely and same as the original, so it will keep the value of the vehicle. 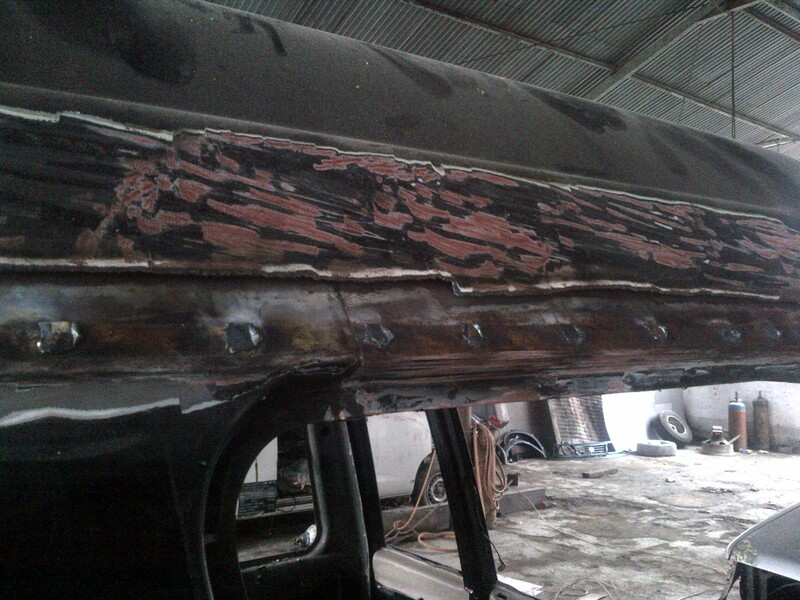 Before welded on the position, all of the new panel part metal are painted by anti rust paint to keep the age of the metal long life and not porous by the rust quickly. 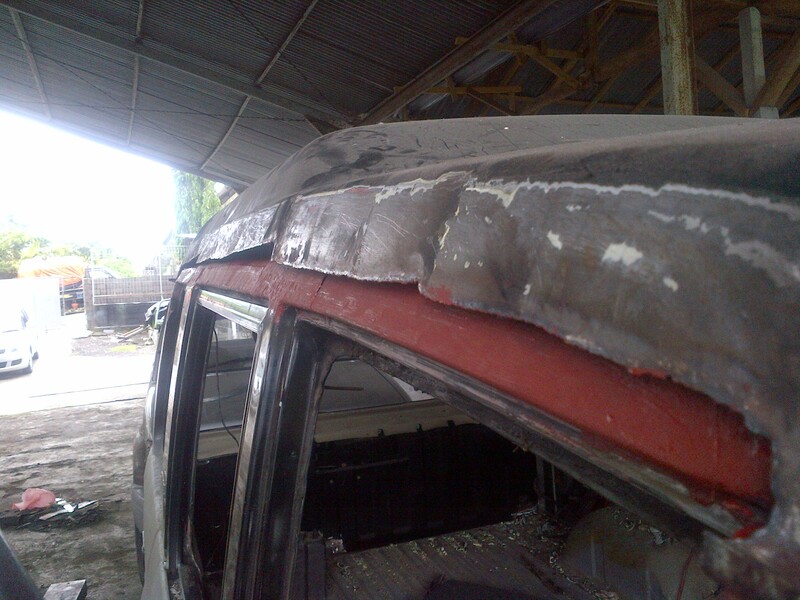 After the roof frame finish, now start to create the water line, this is also a difficult part to remake, as on a Hi Roof Trooper, there is a trap of the roof with a line along the top roof and down line lowering to the front cabin. It’s water line also have a very thin hook for the chrome garnish line. So in order to hold and fit the chrome garnish strongly, the side of waterline must have a small hook to hold it. Since the size of the chrome garnish hook along in the waterline is very thin, it is only a 2 millimeter along the roof, so it is very difficult to make it and need a high patience otherwise the part will be an usable. Mr. Demung can do it very precision as he work it with his patient and lovely. Even it will take more time to finish this part. For me, it’s OK as I wish the result will be in high quality so my da Trooper will be in a high quality performance to make me happy when driving it. Mr. Demung now built the water line from the new flat metal. He take a new flat metal with 1, 5 meter in long with 20 centimeter in wide and make a fold and the using a small hammer to create and make the fold and the fitting it on the roof to make it precisely. I am quiet wondering to see him when make the fold and the water line by hand made. He make the rear waterline first for both side, left and right, while the front side will make it after the rear side finish, as if he cut all the waterline in one time, the roof will fell down. So technically is, cut the both side left and right and let the rear side and the front, then remake the left and the right side finish and welded on it position. After right and left side are fixed and fit, then continue to cut the rear side and the front both side left and right. It will take about 2 weeks to finish these part. 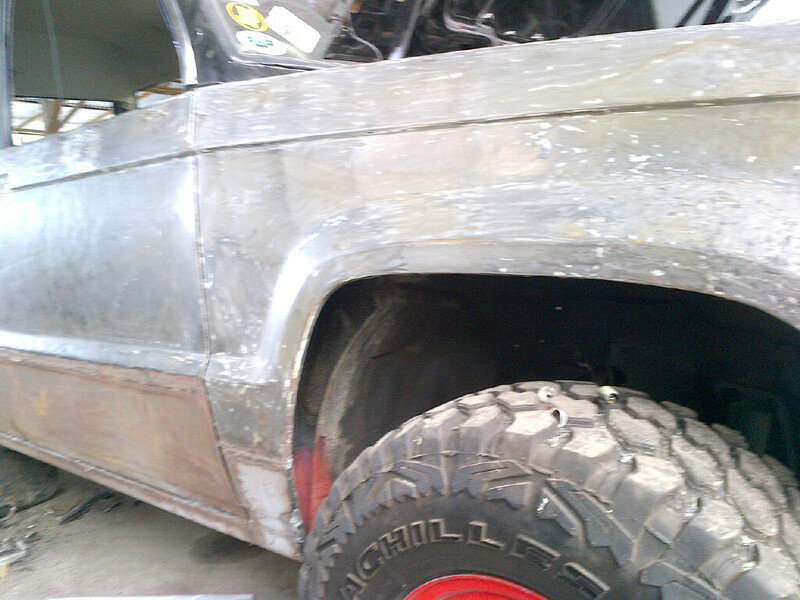 This entry was posted in Feature, GALERY and tagged before paint, brushed, create, finish, new flat metal, patient, Pimp my ride, porous, rusted, sandpaper, welded. Bookmark the permalink.